Intake Port Gasket, 1.310'' x 2.180'' w/ 3/8'' radius Fel-Pro 375-1206 - DO NOT PORT MATCH Intake Manifold to Fel-Pro Gasket. Standard Valve and Stud Locations! 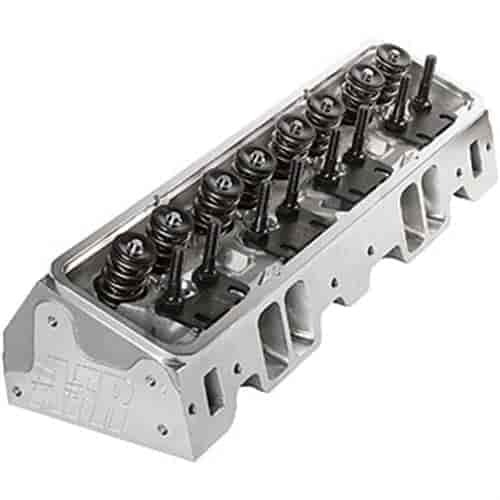 These reasonably priced AFR 210cc intake port small block Chevy angle plug cylinder heads are available in two stages of performance. The Race Ready version features 100% CNC ported intakes while the higher flowing Competition version features 100% CNC ported intakes with greater detail. Both come with 100% CNC ported combustion chambers and 80cc exhaust ports with a 3/4'' thick head deck (ideal for nitrous or blower applications). Standard valves are lightweight 8mm diameter stem, 2.080'' intake and 1.600'' exhaust with AFR's hardened ductile iron interlocking valve seats. The exceptional flow characteristics, 23° valve angle, and standard valve spacing make this the perfect head for 350-400ci engines in bracket drag cars, sportsman oval track racers, and highly modified street class cars operating between 3000 and 7500 rpm (higher rpm ranges possible depending on combination of parts). No special parts are required. Dual valve cover bolt pattern is standard. Exhaust port and bolt pattern are raised .250'' (1/4'') over GM L98 cyilnder heads, this rarely affects header or chassis fitment. These 210cc aluminum cyilnder heads are available in either standard port or spread port exhaust configurations. Spread port heads have the center exhaust ports spread apart 5/8'' over stock L98 GM heads. The reason for spread port heads is to achieve additional cooling in the center of the head where the heat concentration is greatest. As standard headers do not fit, spread port headers are required since the center ports are spread further apart then stock GM products. The increased spacing on the exhaust port also requires the use of exhaust gasket Fel-Pro p/n 375-1409. Spread port heads only come with a Stahl bolt pattern. AFR's spread port head has all the benefits and features of AFR's standard head. .
What would be the best pistons to run with these heads in a 383 stroker motor? This will work on the 400, however, the steam holes will have to be drilled into them.